Hello! Are you on holidays too? Mine started today, and I've had the Christmas tree lights on all day :) This year has been a big one, with a new and more challenging job that's included a bit of travel and the chance to commission recipes (basically, my dream). I am so looking forward to some down time and will be taking a short break here too. I'm looking forward to closing my laptop, making mince pies, and sleeping til whenever. Before I sign off for the year, I wanted to say thank you for being here. I am always on the hunt for recommendations, whether it's a new recipe to try or a different way to think about relationships or work, and hope that some of the things you've seen here have also inspired you to tune into a podcast episode or try something new. Very cute Christmas wrapping featuring pom poms and tassles. I highly recommend this pavlova roll with raspberries and cream for festive get togethers. I made it last weekend and it's surprisingly easy. If you're looking for some Christmas/New Year food ideas, I wrote this round up for work. 8 women on choosing not to have kids (this blew my mind). On the other end of the spectrum, I loved the Hilaria Baldwin's episode of the Unstyled podcast and hearing about her experience of motherhood - she's had 4 kids in four and a half years!! 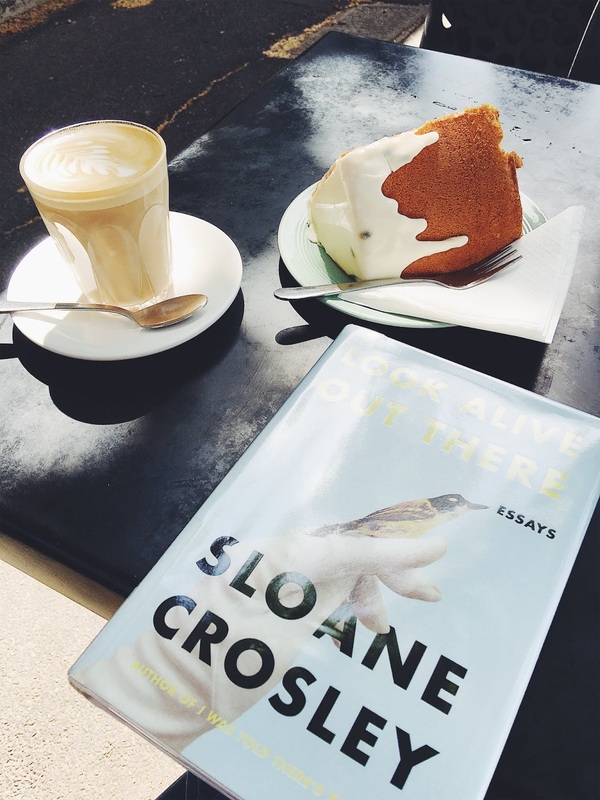 And somewhere in between is Sloane Crosley's funny and slightly gobsmacking essay about freezing her eggs, and contemplating a life with and without kids. A new podcast about creative Australian women of colour? Yes please. And every now and then I need pep talks like this (and usually get them from my boss!). An easy breakfast menu for friends. Grab and go picnics for the lazy warmer days. Two warming soups that aren't pumpkin. My most favourite scrambled eggs for Saturday mornings. An emergency snack that you could serve to guests. Favourite books from the first half of 2018. 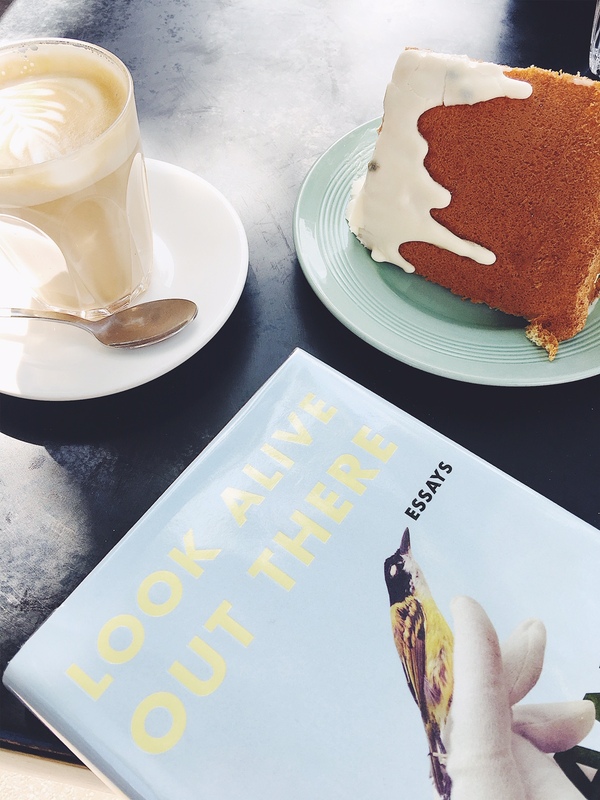 Five things I've learnt from slow living books. To Obama, with love, joy, hate and despair. An American Marriage and my favourite reality show returns. A moving episode of the Soul Music podcast. And if you're looking for a podcast series for long road trips or flights, my picks from this year would be Making Obama, Slow Burn (season 2), Caliphate, Alone: A Love Story (season 2). Or if self-contained episodes are your thing, I save Layers, Unstyled, This is Love, Without Fail, Dispatch to a Friend, and The High Low eps for weekends and work travel cos they always perk me up. I'm planning to nerd out with the Salt & Spine podcast that features in-depth interviews with cookbook authors, including Nigella. Canberra (fave bars, bush walks and doughnuts. I'd also add Taco Taco for fun and casual meals). A couple of nights in Sydney. Melbourne, from a beloved bookstore to the excellent bar that's right nearby. Asking to work part-time is nerve wracking but worth it. How to split housework straight down the middle. Related: how to drop the ball. Surprise dates take the routine out of date night. What to buy for new babies. Our weekly food shop. Plus, how to make meal prep actually happen. Some night time rituals that help me unwind. Building a tiny bag of toys for tiny visitors. How to bring the holiday spirit into everyday life. Similar, making a wish list for the weekend. Work-wise, I can't recommend the Todoist app enough. I use the free version and it's helped me work out what my priorities are each day and saved me from writing and re-writing to do lists in my notebook, which is its own form of procrastination. 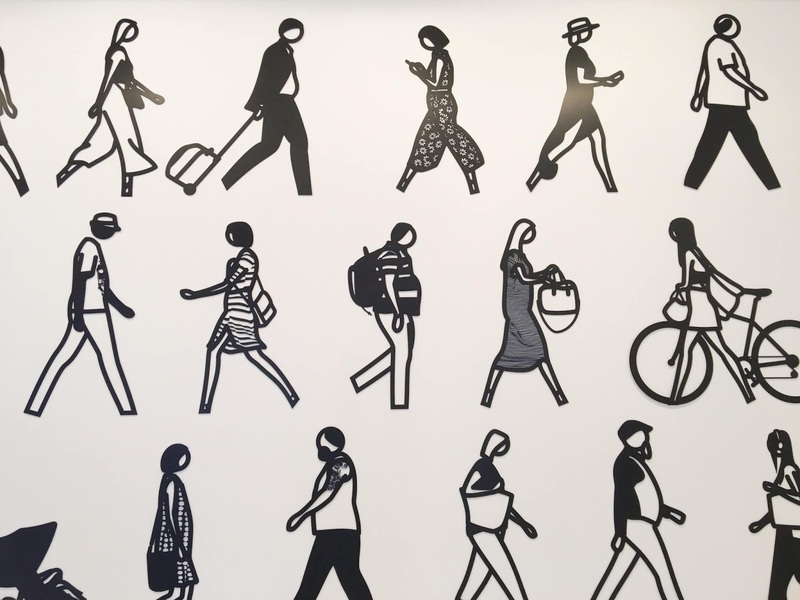 Are you travelling for Christmas or working through the holidays? I finish up for the year on Thursday and things are already feeling festive. Right now I'm snacking on some Christmas cake that I made in November. I finally cut it open over the weekend to divvy up between friends as gifts. And tonight we'll be putting up our mini Christmas tree! Christmas Day will be a lunch at my sister's place and I'll be bringing a Christmas cake to share, and some homemade mince pies too. I'm also really looking forward to Christmas brekkie at home, which is usually coffee, mangoes and panettone with Tony before we exchange presents. We've also just marked three years in Canberra with a handful of end of year rituals. We brought these spice cookies to May and Sam's an annual Christmukkah party, which was a bagel brunch. And we ate the most delicious meal at Sarah and Mark's place for our annual Christmas dinner, this time with their daughter Zoe as a first time guest. They made Samin Nosrat's buttermilk chicken, Annabel Crabb's glass potatoes (they're a revelation), and I made my first ever pavlova roll with raspberries and cream. It was the last recipe I had to test for the year and it was a triumph! Finally, let's talk Christmas books! I secretly love the days after Christmas, where everyone's back in their own homes and it's time for naps, summer fruit and books. I'm planning to treat myself to Sally Rooney's Normal People and Any Ordinary Day by Leigh Sales. Make your own after dinner mints (minus the foil packet!). A very sweet and nerdy proposal story. Tony asks for the same birthday cake every year - an unbaked cheesecake. I normally make this one but decided to do something a little fancier this year and made mini cheesecakes with white chocolate, strawberries and rose water. They were a hit. I really liked this interview with Osher Gunsberg about getting yourself out of a rut. Especially this line, "When it comes to work, the why morphs slightly from being the 'best' to being the most professional he can be." If you're catching up on podcasts, I can recommend this episode of This is Love, featuring a snail love story. Also, a very inspiring interview from Without Fail. And this week's ABC Life recipe is awesome! It's a salad salsa that could a fun starter - or you could just eat it with chips for dinner like we did on Monday night. Highly recommend. We had the nicest time in Melbourne, eating lots of great food and checking out a bunch of art galleries - our two favourite things. By the end of the week, I had ditched my watch and make up and was feeling extremely relaxed. 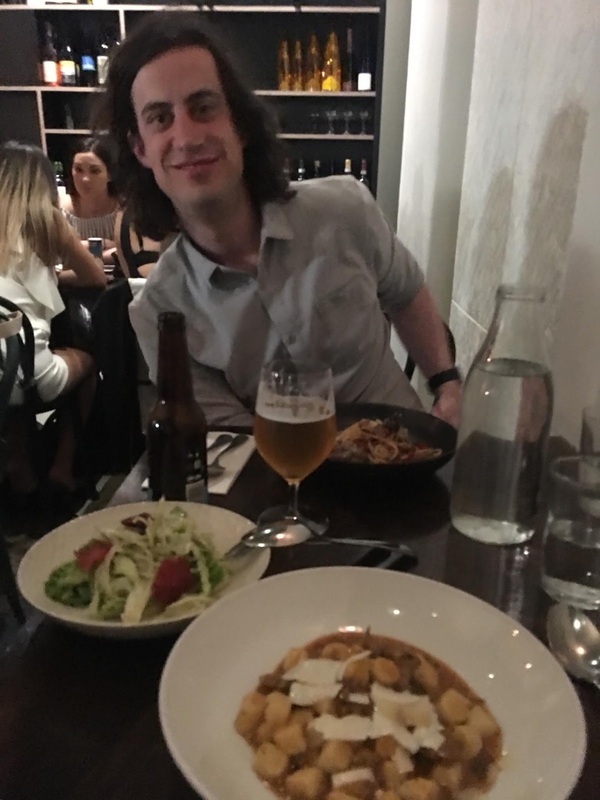 Our first day in Melbourne was pretty perfect. 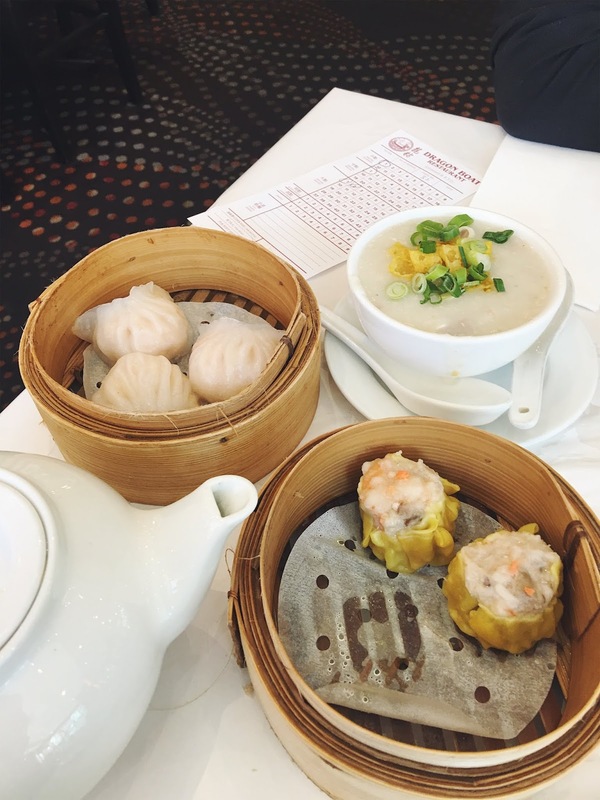 We rolled our bags into Chinatown for yum cha at Dragon Boat, which came highly recommended. It was such a great yum cha spot, and also a good place to fuel up and catch our breath before heading back into the city. 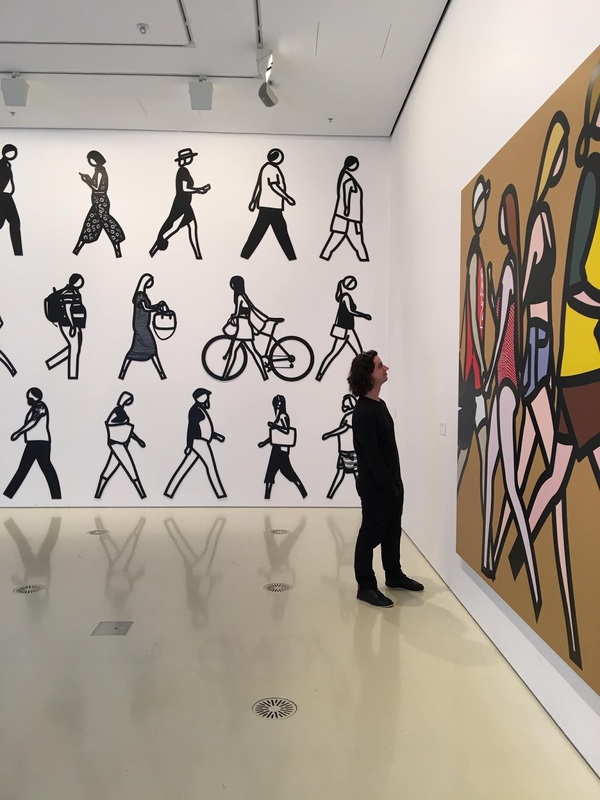 There are two great shows at the National Gallery of Victoria at the moment, and they're both free! 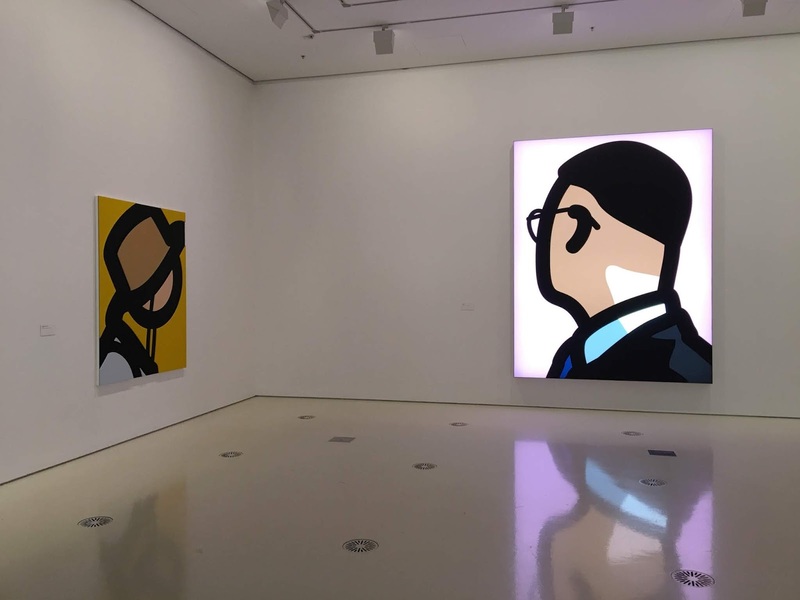 My favourite was Julian Opie, which featured bright and colourful video portraits of characters doing very everyday things like walking. The details made the show magical, with the artist capturing everything from the gait of individuals, to the intricate pattern of their lace dress or tattoos. Check out the kids space if you can, even if you don't have any of your own. Trust me, it's super cute (and filled with adults!). We also both really loved Australian photographer Polly Borland's exhibition at the Fed Square gallery space. It's playful and kind of odd too. Then it was onto Heart Attack & Vine, which is one of my workmate's all-time favourite bars. It's a really cute space with incredible snacks constantly being made at the counter. We ordered drinks and a selection of mini snacks and had a great time. For dinner, we went to a new favourite, DOC pizza for the best margherita (they specialise in mozzarella!) and a greens salad which was almost as good. Afterwards we wandered over to Pidapipo for gelato cones with warm nutella, and they were so good we made sure we went again before we went home. And no visit to Carlton is complete without a stop at Readings, which is my favourite book shop. Holidaying midweek was especially handy when it came to visiting a hyped up eateries :) We went to Lune Croissanterie one morning and sat at the counter, watching a small army of croissant makers do their thing while nibbling on their handiwork. The croissants are pretty amazing, somehow sweet and savoury at the same time with just the right amount of flakiness. A little bit of planning went into our visit because my Dad (whose favourite foods include croissants and ice cream) went on a day when the cafe was only doing takeaways. Plus I'd read that sometimes there's an hour-long queue, and assumed it'd be wise to avoid the weekend. I also made it to Beatrix, a tiny bakery that I've been obsessing over ever since I stumbled across them on Instagram. Especially because they seem to have an insane number of cakes on offer each day. I ordered a giant slice of pillowy orange chiffon cake that came with a tangy icing and some mince pies to take away. Beatrix is in north Melbourne, and a short tram ride from the city (that's if you get off at the right stop!). There's only a handful of seats but they're set up for takeaway, with lovely hard-to-squash cake boxes. We also had dinner at Tip00, which was the first place I booked after we'd sorted our flights and accommodation. I felt like a nerd, getting in super early but we almost missed out! Apparently Fridays and Saturdays are usually booked out three months in advance, so we went for a late sitting on a Thursday night and had no regrets. Everything from the focaccia bread course to the deconstructed tiramisu was unreal. Finally, Saturday lunch at Good Days in Brunswick was a shared highlight. Tony ordered the chicken rice and I had the famous noodle salad with lemongrass chicken skewers (you can also get it with spring rolls on top!). 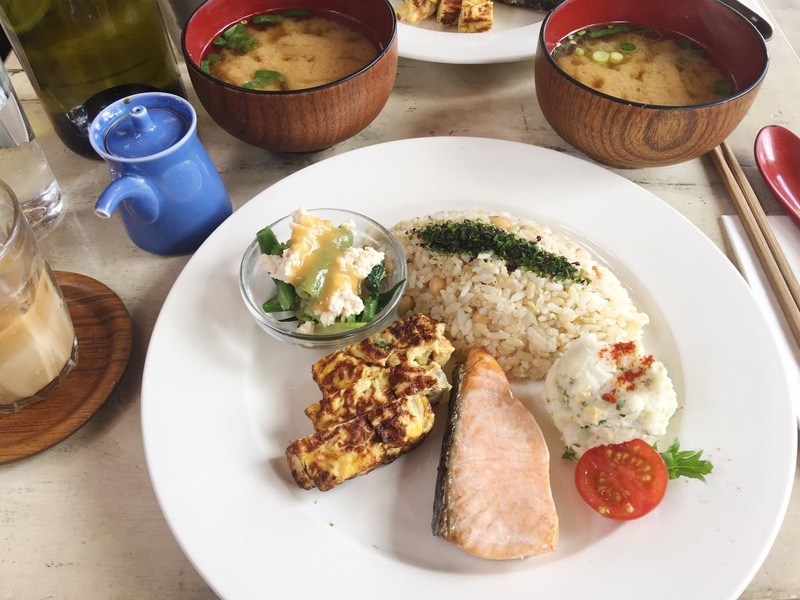 And I also went to Cibi for lunch with my friend Danie, where we both ordered the Japanese breakfast special. The Cibi shop was especially beautiful, stocking everything from ceramics to fancy panko crumbs and different types of seaweed. So that's it for our 2018 Melbourne trip! I thought my flying days were done for the year but I'll be making a day trip to Sydney on Monday, and then counting down the days til I can pick up my Christmas ham. We're close! Anna Jones's vegetarian top 10, just in time for end of year entertaining. Speaking of, I learnt a lot editing this piece about cooking for vegans from Hetty McKinnon. Biggest takeaway? Vegan food is everyday food - especially when it comes to staples like pasta, legumes, and olive oil. Need a dish for this Christmas? She shared a vegan potato salad recipe and it's yum! If you're a fan of the NY Times column Modern Love, may I introduce you to Tiny Love Stories, sent in by readers. I loved the one about the baby outfit! I experienced insane hayfever today so retreated to the aircon of our Airbnb after lunch and watched the Gaga doco on Netflix and loved it. Two kind of Christmasy things... an alternative festive playlist made up of songs from Woody Allen films. And my friend Angie put me onto the show Travel Man, and this episode in Hong Kong made me laugh! It co starts Jon Hamm. And we went to a Christmas/Hanukkah party last Sunday, where there were bagels, jam doughnuts and twin babies to cuddle! I came away obsessed with latkes and want to try this recipe, recommended by Leslie. Our friends served theirs with a dijon mayo. I would eat them with basically anything! Have a wonderful weekend and catch you soon, with a few Melbourne notes.